In the group Edit click New Activity / New Milestone or Edit Activity / Edit Milestone. Right-click on the project plan area and click New Activity / New Milestone or Edit Activity / Edit Milestone in the context menu. Double-click an item in the project plan. In the Edit Work Package dialog box, in the Resource box, click . Use the quick selection to add a new resource. Click the Arrow . You can see in the drop-down list all resources, that have been added to the project. In the Resource box the new name will be displayed. Choose the notification type from the Notification drop-down list. 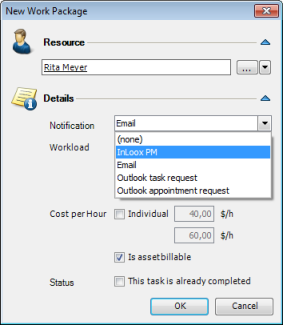 Choose one of the following: (none), InLoox PM, Email, Outlook task request, Outlook appointment request. For more information, see the category Budget overview. You will see the workload of the resource in percent (%) during the defined time period. The effort determines the planned time and costs on the Budget Overview page, in the Budget Overview area, in the Planned expenses (resources) column. For more information see the category Budget overview. In the New Activity / New Milestone or the Edit dialog box, on the Resource tab, click Work amount (h) to open the Resource overview. The Resource overview displays an overview of all resources involved in one particular project or in all projects. For more information see Open and manage the resource overview. How to add resources to a planned activitiy in InLoox PM 7 • Copyright 1999-2019 © InLoox, Inc. All rights reserved.